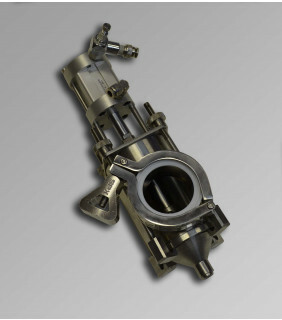 For top fill applications that require a narrow stream of liquid to be filled into a tight head container (but do not require a diving lance style fill head), ABA offers a straight-style or direct flow fill head. These fill heads are especially useful for filling containers with screw caps and have even successfully been utilized in our top-off systems. Additionally, filling small containers such as half pints is often easier utilizing these fill heads as compared to cone style fill heads, as the flow of liquid is less spread during filling. Unlike the other styles of fill heads we manufacture, the direct flow style fill heads are only available in one size and do not have an adjustable stroke air cylinder. All of our fill heads are designed and manufactured using high quality components and parts and are constructed with stainless steel parts made here in the USA. Please contact us today for expert advice or assistance in selecting the best fill head for your fill environment and product. We offer superior filling machines and equipment to our clients.